A file of information by Albert Bishop has been deposited in Barnsley Archives, however more information and especially photographs are always welcome. Please contact us on bwmp2015@gmail.com if you have information about any of these men. A newspaper cutting about the church and the tablet can be found here. The newspaper cutting lists the names on the plaque, but it is noticable that the two lists are not identical. The remainder of the article describes the service and the unveiling of the plaque. 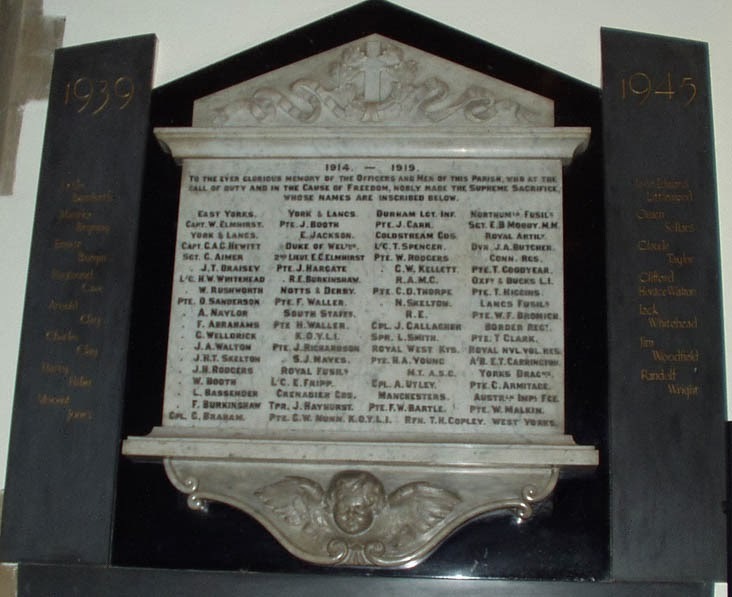 On Sunday last an impressive service was held in Worsboro’ Parish Church on the occasion of the unveiling by Colonel Sir Joseph Hewitt of a Memorial to those who fell in the Great War. York and Lancs: Capt G A G Hewitt, Sergt G Aimer, Sergt J T Draisy, L/Cpl W Rushworth, L/Cpl H W Whitehead, Pte O Sanderson, Pte A Naylor, Pte F Abrahams, Pte G Weldrick, Pte J A Walton, Pte J H T Skelton, Pte J H Rodgers, Pte W Booth, Pte L Bassender, Pte F Burkinshaw, Pte J Booth, Pte E Jackson. Duke of Wellington’s: 2nd Lieut E C Elmhirst, Pte J Hargate, Pte R E Burkinshaw. There are forty-six names in the article. Only five of these appear on the Combined Worsbrough War Memorial on the edge of St Thomas' Worsbrough Dale's churchyard. Two more appear on the War Memorial at St Luke's Worsbrough Common.